JNUSU Election Result 2017: In the election for the central panel of the Jawaharlal Nehru University Students Union (JNUSU), United Left won all four positions. Officials of the election panel said that the results of the counting of votes started yesterday night at 9.30 pm were announced late last night. The United Left candidates were ahead in the counting and their supporters had already started celebrating the JNUSU Election Result 2017. 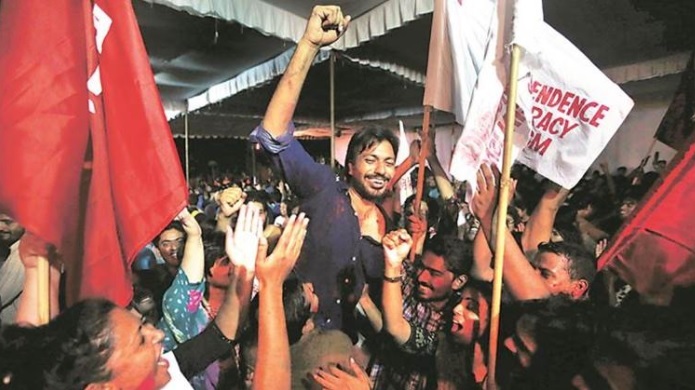 After the elections for the Central panel of the Jawaharlal Nehru University Students Union (JNUSU), counting of votes has been released and more than 65 percent of the votes have been counted, in which the United Left Front has been heading for the top four posts and BAPSA has pushed ABVP in third place. Officials of the election panel said that the counting of votes started at 9.30 pm last night is still going on. A total of 4,639 votes were cast in the elections. He said that for the post of president, United Front candidate Geeta Kumari got 936 votes whereas Shabana of Birsa Ambedkar Phule Students Association (BAPSA) got 661 votes and Akhil Bhartiya Vidyarthi Parishad (ABVP) Nidhi Tripathi received 633 votes. Similarly, the candidates of the Joint Left Front are also on the posts of vice-president, general secretary, and joint secretary.